How can I make my home more secure without breaking the bank? What are necessary upgrades and what are merely eye candy that look more secure? These two questions are easy to answer if you live at Fort Knox but not so simply answered in an urban environment. Door locks are a good starting point provided that they are going into a good door and a good frame. Dead bolt locks should go 2 ½ to 3 inches and lock into a solid frame, not just a hole in the wood. Window bars may keep people out but they are just as detrimental if you are trapped inside. A better solution is a film application developed by 3M to make windows virtually impregnable. This way you can leave a window or two unprotected as an escape route if you are so inclined but it will not be noticeable to the casual observer (read this as crook casing your joint). Garage doors need to be left down. Remove the yank and go rope with the red handle, and security film the garage door windows. Exterior illumination is key to security. Motion sensor lights for all corners and blind spots is a good start. They may annoy the neighbors but most of them are jealous that their home is now an easier target. Sometimes sprucing up outside is a good thing security wise. Get rid of all normal shrubbery, and plant Hell Thorn, Rose of Sharon or any other brutally thorny plant in the previously landscaped area. You now have a MEAN GREEN defense that prowlers would not appreciate and it keeps them away from the sides of your home and under windows etc. Many home owners have recently become new gun owners and this is not a bad thing. Here is the crux of the issue…many have no formal training and very little idea about ballistics and penetration. Many more also do not know basic tactics and are not that well versed in firearm safety for that matter. Do not get wrong, I am a huge proponent of loaded firearms in the home. I also am a huge fan of training and practice, practice, practice. Whether your home defense weapon is a shotgun, pistol or rifle that is a choice only you can make. I personally like a Mossberg 500 with #6 shot and high brass shells. Inside a house it is game on and that is as much stopping power as you can dish out in 24 feet (average distance of a living room from wall to wall). If I hear something at night it is what I grab. A pistol is my other choice. During daylight hours (not in bed asleep) I am generally armed or have a loaded weapon nearby. Preferably a .45 with a good quality personal defense rounds (read that as a high quality jacket hollow points). The downside of the shotgun is maneuverability. The upside is the amount of stopping power and the OH CRAP factor of the kershack…kershack sound of racking the slide. This has been a proven deterrent for thieves and will continue to be. The pistol is far more maneuverable, but has a tendency to over penetrate walls and doors. A rifle is my last choice due to the over penetration and lack of maneuverability. I do not answer the door unarmed. You should not either. Home invasion robberies are becoming more prevalent and more violent. Know who is on the other side of the door. The peephole is there for a reason. If not have one installed. If you cannot see who is at the door because they are covering the lens or hiding just out of the way…get to a means of communication. Always have more than one means of contacting 911. For instance we have a landline (traditional phone), Cell phones, and a panic button built into our alarm system. They might remove one or two means of communication, but will not get all three. Our family has a plan. Every member is proficient with firearms. Everyone knows how to get to the safe area and handle themselves accordingly. 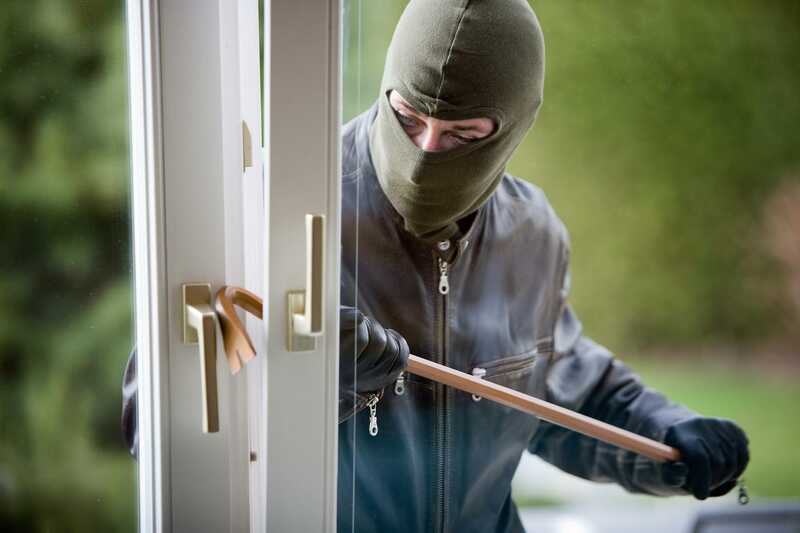 A home invasion can unfold in a manner of seconds so be prepared to conduct yourself accordingly in the minutes it will take for the police to arrive. Finally…alarm systems. Every one who can afford one should get one. Ask the installer for extra decals and place them in places that generally do not get door sensors. This include outside utility room and shed room type entrances that although do not have access to the interior by conventional means, make a dandy place to break in and break through a wall into you home. Motion sensors and glass breakage sensors are a must. A yappy dog is a good deterrent, and serves as a mobile alarm system for times when you are home and the alarm is not set. They sense danger faster than we do and are a relatively easy upgrade to your home security, once you get them housebroken. Our dog is the most vicious sounding thing you would ever hear when a stranger comes to the door. I intend to keep it that way. A word to the wise. When shopping for alarms systems, contact the company directly. You should know who, when and why they are coming out. Do not trust ANYONE who just wanders up onto your property posing as an alarm installer/representative. Many are scamming and casing your place. Do not allow solicitors, or strangers into your house. It is not paranoid, it is smart and smart lives longer than stupid.